KENNEDY SPACE CENTER, FL – A state of the art quartet of identical science satellites aimed at unraveling the mysteries of the process known as magnetic reconnection is slated for a spectacular nighttime blastoff tonight, March 12, atop a United Launch Alliance Atlas V rocket on Cape Canaveral, Florida. The $1.1 Billion Magnetospheric Multiscale (MMS) mission is comprised of four formation flying and identically instrumented observatories whose objective is providing the first three-dimensional views of a fundamental process in nature known as magnetic reconnection. Magnetic reconnection is a little understood natural process whereby magnetic fields around Earth connect and disconnect while explosively releasing vast amounts of energy. It occurs throughout the universe. Liftoff is slated for 10:44 p.m. EDT Thursday March 12 from Space Launch Complex 41 on Cape Canaveral Air Force Station, Florida. The launch window extends for 30 minutes. You can watch the MMS launch live on NASA TV, below, starting at 8 p.m.
Spectators ringing the Florida space coast region and ranging well beyond should be treated to a magnificent fireworks display and skyward streak of perhaps several minutes – weather and clouds permitting. 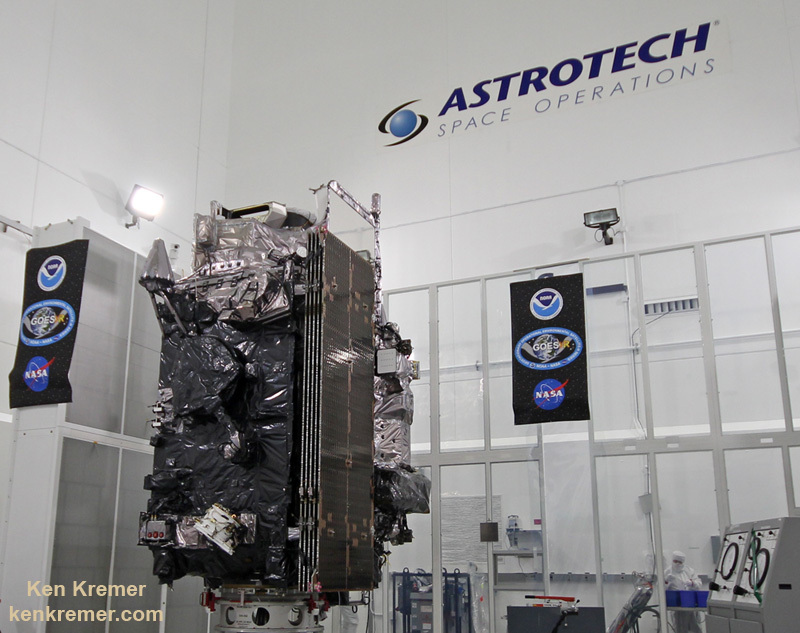 Currently the weather forecast is 70 percent “GO” for favorable conditions at launch time. The primary concerns for a safe and successful launch are for cumulus clouds and thick clouds. 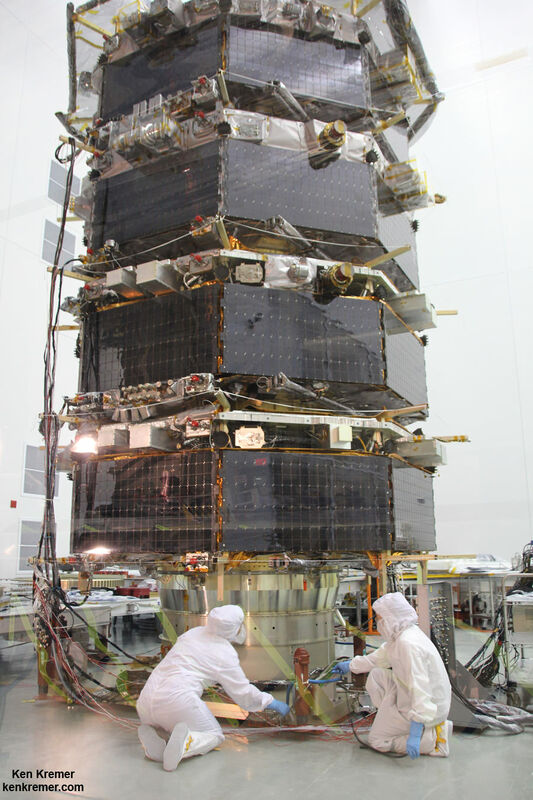 The 195 foot tall rocket and encapsulated MMS satellite payload were rolled out to Space Launch Complex-41 on Wednesday March 10 at 10 a.m. on the Mobile Launch Platform (MLP) about 1800 feet from the Vertical Integration Facility or VIF to the Cape Canaveral pad. 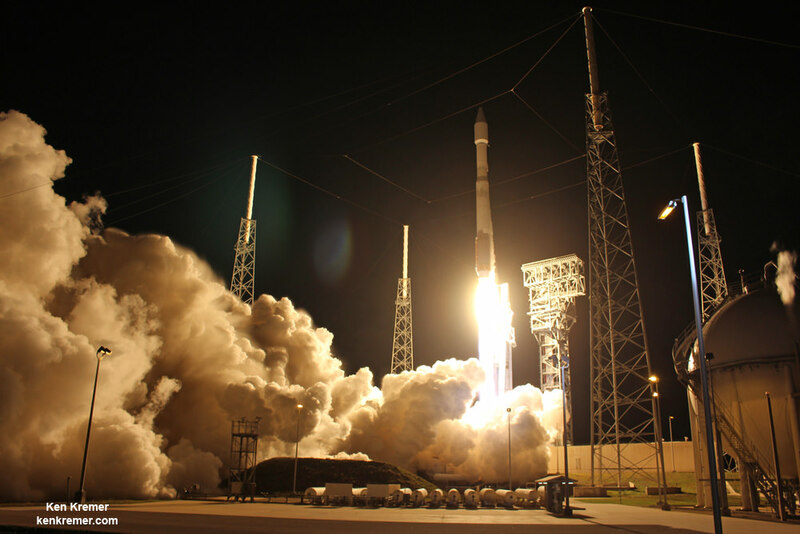 The two stage Atlas V rocket will deliver the MMS constellation to a highly elliptical orbit. The venerable rocket with a 100% success rate will launch in the Atlas V 421 configuration with a 4-meter diameter Extra Extended Payload Fairing along with two Aerojet Rocketdyne solid rocket motors attached to the Atlas booster first stage. The Atlas first stage is powered by the RD AMROSS RD-180 engine and the Centaur upper stage is powered by the Aerojet Rocketdyne RL10A engine producing 22,300 lb of thrust. The first stage is 12.5 ft in diameter and fueled with liquid propellants. The RD-180 burns RP-1 highly purified kerosene and liquid oxygen and delivers 860,200 lb of sea level thrust. 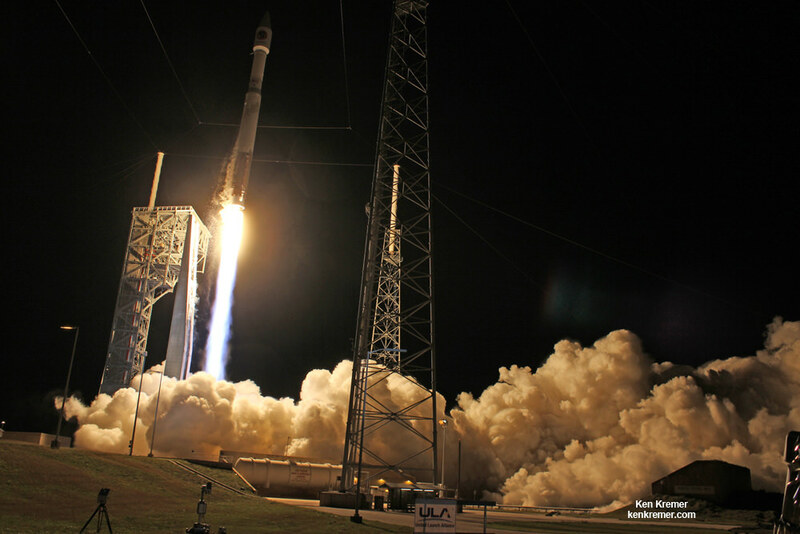 This is ULA’s 4th launch in 2015, the 53nd Atlas V mission and the fourth Atlas V 421 launch. “This is the perfect time for this mission,” said Jim Burch, principal investigator of the MMS instrument suite science team at Southwest Research Institute (SwRI) in San Antonio, Texas. After a six month check out phase the probes will start science operation in September. Unlike previous missions to observe the evidence of magnetic reconnection events, MMS will have sufficient resolution to measure the characteristics of ongoing reconnection events as they occur. The four probes were built in-house by NASA at the agency’s Goddard Space Flight Center in Greenbelt, Maryland where I visited them during an inspection tour by NASA Administrator Charles Bolden. I asked Bolden to explain the goals of MMS during a one-on-one interview. “MMS will help us study the phenomena known as magnetic reconnection and help us understand how energy from the sun – magnetic and otherwise – affects our own life here on Earth,” Bolden told Universe Today. MMS measurements should lead to significant improvements in models for yielding better predictions of space weather and thereby the resulting impacts for life here on Earth as well as for humans aboard the ISS and robotic satellite explorers in orbit and the heavens beyond. The best place to study magnetic reconnection is ‘in situ’ in Earth’s magnetosphere. This will lead to better predictions of space weather phenomena. Magnetic reconnection is also believed to help trigger the spectacular aurora known as the Northern or Southern lights. 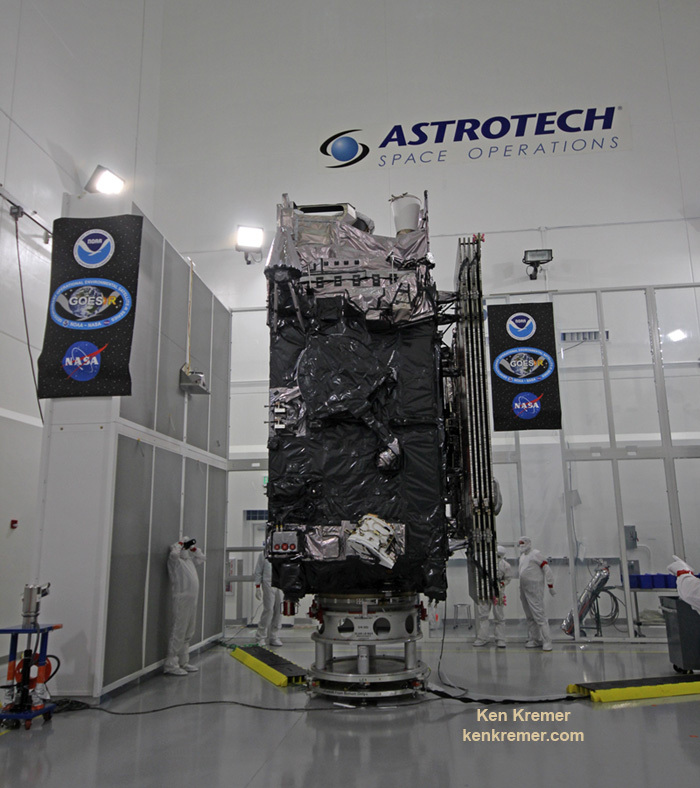 Watch for Ken’s ongoing MMS coverage and he’ll be onsite at the Kennedy Space Center in the days leading up to the launch on March 12. Stay tuned here for Ken’s continuing MMS, Earth and planetary science and human spaceflight news. In just 7 days, Earth’s most advanced robotic roving emissary will liftoff from Florida on a fantastic journey to the Red Planet and the search for extraterrestrial life will take a quantum leap forward. Scientists are thrilled that the noble endeavor of the rover Curiosity is finally at hand after seven years of painstaking work. NASA’s Curiosity Mars Science Laboratory (MSL) rover is vastly more capable than any other roving vehicle ever sent to the surface of another celestial body. Mars is the most Earth-like planet in our Solar System and a prime target to investigate for the genesis of life beyond our home planet. Curiosity is all buttoned up inside an aeroshell at a seaside launch pad atop an Atlas V rocket and final preparations are underway at the Florida Space Coast leading to a morning liftoff at 10:25 a.m. EST on Nov. 25, the day after the Thanksgiving holiday. “It’s not your father’s rover. It’s a 2000 pound machine that’s over 6 feet tall – truly a wonder of engineering,” McCuistion stated. The car sized rover is due to arrive at Mars in August 2012 and land inside Gale Crater near the base of a towering and layered Martian mountain, some 5 kilometers (3 miles) high. Gale Crater is 154 km (96 mi) in diameter. The landing site was chosen because it offers multiple locations with different types of geologic environments that are potentially habitable and may have preserved evidence about the development of microbial life, if it ever formed. Gale Crater is believed to contain clays and hydrated minerals that formed in liquid water eons ago and over billions of years in time. Water is an essential prerequisite for the genesis of life as we know it. The one ton robot is a behemoth, measuring 3 meters (10 ft) in length and is nearly twice the size and five times as heavy as NASA’s prior set of twin rovers – Spirit and Opportunity. Curiosity is equipped with a powerful array of 10 science instruments weighing 15 times as much as its predecessor’s science payloads. The rover can search for the ingredients of life including water and the organic molecules that we are all made of. Curiosity will embark on a minimum two year expedition across the craters highly varied terrain, collecting and analyzing rock and soil samples in a way that’s never been done before beyond Earth. Eventually our emissary will approach the foothills and climb the Martian mountain in search of hitherto untouched minerals and habitable environments that could potentially have supported life’s genesis. With each science mission, NASA seeks to take a leap forward in capability and technology to vastly enhance the science return – not just to repeat past missions. MSL is no exception. Therefore this mission uses new technologies to enable the landing of a heavier science payload and is inherently risky. The one ton weight is far too heavy to employ the air-bag cushioned touchdown system used for Spirit and Opportunity and will use a new landing method instead. Curiosity will pioneer an unprecedented new precision landing technique as it dives through the Martian atmosphere named the “sky-crane”. In the final stages of touchdown, a rocket-powered descent stage will fire thusters to slow the descent and then lower the rover on a tether like a kind of sky-crane and then safely set Curiosity down onto the ground. NASA has about three weeks to get Curiosity off the ground from Space Launch Complex 41 at Cape Canaveral Air Force Station in Florida before the planetary alignments change and the launch window to Mars closes for another 26 months. Assembly of the powerful Atlas V booster that will rocket NASA’s Curiosity Mars Science Laboratory rover to Mars is nearly complete. The Atlas V is taking shape inside the Vertical Integration Facility at Space Launch Complex 41 at Cape Canaveral Air Force Station in Florida. The rocket is built by United Launch Alliance under contract to NASA as part of NASA’s Launch Services Program to loft science satellites on expendable rockets. The Atlas V configuration for Curiosity is similar to the one used for Juno except that it employs one less solid rocket motor in a designation known as Atlas 541. 4 indicates a total of four solid rocket motors are attached to the base of the first stage vs. five solids for Juno. 5 indicates a five meter diameter payload fairing. 1 indicates use of a single engine Centaur upper stage. Blastoff of Curiosity remains on schedule for Nov. 25, 2011, the day after the Thanksgiving holiday in the U.S. The launch window for a favorable orbital alignment to Mars remains open until Dec. 18 after which the mission would face a 26 month delay at a cost likely to be in the hundreds of millions of dollars. Curiosity is set to touchdown on Mars at Gale Crater between August 6 & August 20, 2012. The compact car sized rover is equipped with 10 science instruments that will search for signs of habitats that could potentially support martian microbial life, past or present if it ever existed. Meanwhile NASA’s Opportunity Mars rover is nearing 8 continuous years of Exploration and Discovery around the Meridiani Planum region of the Red Planet.